Obviously every wedding we feature is a “Rock My Wedding” type of wedding, hence why we share such beautiful celebrations with our gorgeous community on a daily basis. Will and Lisa’s big day however actually had more than half the team actually there, plus various recommended suppliers, decor ideas taken from these very pages and more laughter,love and memorable moments than I could possibly recall. Will has been a friend of my husband and I’s for years and when he met the lovely Lisa we were over the moon, she was (and is) the perfect fit. Lauren C (she of RMW Facebook management and stylish interiors fame) has coincidently been a friend of Lisa’s since school so we spent muchos time on the dance floor/drinking champagne/generally having the best time ever. RMW Sponsors Anna Clarke and Simon Clarke captured the day on camera and film and guess who the second shooter was? our very own Adam Crohill. Adam was solely responsible for ensuring Will and his best man Tom got ready on time (!) and that much like the brides “getting ready” images, the groomsmen were recorded in all of their glory too. Tom decided he would turn up to Will’s room in just his neon underpants and matching trainers. This was hilarious. Even more hilarious that little did he realise he would appear in aformentioned underpants and trainers in front of the Nation. Yep. I’ve included those images folks. 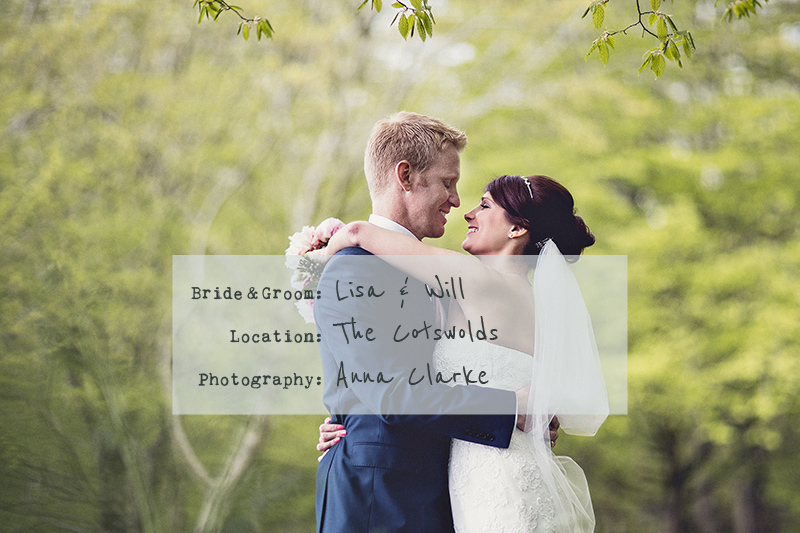 Will and Lisa’s wedding will be in two parts, sometimes it’s nice to mix it up a bit and hear about all of the planning in real detail, Lisa has written a thorough, witty and heart-warming account of everything from the initial design ideas to the the entertainment and everything in between. Enjoy you gorgeous lot you. Most brides I have spoken to say, “Well if I was to do it all over again I would do this… or I wish I’d done this…..”. I can quite happily say that there would not be one thing I would have changed 😉 I was very lucky. I’m a Yorkshire lass at heart having been brought up in the hills of Sheffield but I knew very early on that Sheffield wasn’t the place for me really. All my friends and family had moved on and sadly my dad passed away pretty much 3 years to the day, so I wanted to do something completely different. One of the things, (other than my other half) that brought me to the West Midlands was the sheer beauty of the Cotswolds. I am so lucky to have such beautiful surroundings on my doorstep and I instantly fell in love. So when Will popped the question, (you can hear all about this here) it was only a matter of days before I knew I had to take advantage of this. Will was a big fan of this too. We had quite a big party to attend to so this was the tricky part. There were so many beautiful places here but only certain ones would accommodate our 150 guests. 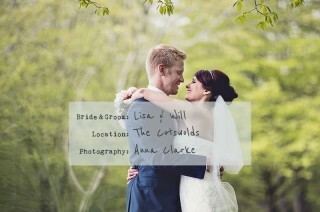 Then we found it, it was an instant love for this place, Cripps Barn, in Bibury just by Cirencester. This was where we were going to say our vows and party with all our close friends and family, all under one roof. It was perfect. Phew… I thought, venue booked, I can now chill for a bit before the craziness begins. I was actually quite adamant that I didn’t get too stressed about planning our wedding. I wanted to enjoy every minute so I actually ignored all the timing plans that you get sent and created my own. I knew there were things I could get sorted pretty early on so less panic nearer the time. Some good advice brides to be! Do what you can early. So next was the dress, to be honest the dress wasn’t the most important thing for me, it was the photographer and the music, however as time went on I got more involved than I ever thought and found the dress for me. I went to places that just threw dresses on me without a care but I wanted it to be special. I was only going to be a bride once and wanted this to be an experience that both mums and I would never forget. I only went to a handful of shops in the end and invited both my mum and mum-in-law to be (who has 3 sons) and it was a fabulous day. I think we were quite tipsy by the end of it too. The dress of my dreams was a Pronovias dress from Grafton Manor, Bromsgrove. I wanted something that made me feel like a little princess and this was it. And yes I did the whole ‘tears in my eyes’ when I found it. Grafton Manor made the whole process a pleasure and delight. I would completely recommend. I found a head piece there too which matched perfectly with the detail on the dress by Ivory and Co and although I didn’t think I even would want a veil I ended up getting the longest one I could find. You’re only a bride once right?! My little princess dream was complete. So now I had the venue and the dress, I needed to tell everyone about it. This got me a bit as I didn’t really want to buy anything off the shelf. I’m a marketeer myself so this was very important to me. This was not going to be a formal wedding and I wanted the invites to say everything about our big day. I didn’t have to look around for long when Lauren, yes RMW Facebook Goddess and owner of Fairly Light introduced me to her sister and husbands wedding stationary business, Bonny and Clyde (Hannah & Toby). I’ve actually known Lauren for 21 years now as we shared our secondary school life together! Oh and Uni… oh and life in the West Midlands… I don’t actually know what I would do without her! And as you all didn’t know already she is amazingly talented and more importantly a very good friend. Next on my list was the Photographer. Well when you have a very good friend happy to help if needed – who owns the biggest wedding blog in the UK, Mrs O’Shea! I had to look on the wondrous ‘Love Lust List’ and took my time to go through many recommendations. I didn’t feel the need to go anywhere else, as I knew the RMW team would have done all the hard work for me and selected the best ones. Then that was it, I found her, the exceptionally talented Anna Clarke, I had to have her at our wedding, so as soon as we got the date I was straight on the phone and thankfully she was free that weekend (I would have moved it if she hadn’t been!) but basically every other weekend she was busy. It must have been a sign. Will and I both loved her work from what I’d seen on posts we knew instantly that her work would work perfectly with the venue and both mine and Will’s personality. We met Anna only a few weeks later and in the meantime also discovered Simon Clarke, the wonderful hubby of Anna’s who does unique videography. At first I was a bit worried a video would be a little cheesy but the wedding video world has totally moved on and the video style was unbelievably stylish and contemporary. Every person I know that hasn’t had their day filmed massively regrets it, so my advice if you can, do, as you will have it forever. Will and I instantly warmed to Anna and Simon; they were both extremely calm people. The last thing you want on your wedding day is a photographer bossing you about, let’s face it, and I could just see Anna and Simon putting us at ease and really making the day. My mum-in-law to be recommended a hair dresser in Chipping Camden, Martin Sheen at Mode Hairdresser’s. I went a couple of times to get my hair cut before I had a trial as I just knew I would change my mind a number of times so I decided to wait until nearer the time. I already knew I wanted him anyway so that wasn’t an issue. Luckily a lady called Alice also did make up trials in the salon. I had a go and loved it. My make up was sorted. I actually discovered the most amazing foundation ‘By Terry’ – it glided on, wasn’t too much and lasted all day long. And of course I had to have my Chanel Imitable Intense Mascara (nothing ever compares!! ), Laura Mercier’s Pink lipstick (Charlotte’s recommendation) and blusher. I’d had a French manicure a couple of months before to see what I thought but I just didn’t like it, it wasn’t me so I went for a colour instead. I’m so glad I did and it went perfectly with my colour theme pink, pink and um… more pink. The shoes took me a while to find as I didn’t want to spend a fortune especially as the dress was slightly more than I wanted to pay so I ended up getting them from Jenny Packham at Debenhams of all places but the lace matched my dress flawlessly. The only downside was they were really high so I actually bought a second pair I could wear for the dance floor that I could even wear again. One can never have too many shoes! Rochelle and Emma were my first choices for bridesmaids. I had been Rochelle’s bridesmaid the previous year but more importantly she introduced me to my future husband. It’s quite funny as well because Will introduce her to her lovely husband too when they were only 15. I have to thank Rochelle a lot for the introduction, although it took over 10 years for us to finally get together, plus we have had a blast together since we have known each other. Uni life wouldn’t have been the same without her and there is never a dull moment with Rochelle in your life. Emma and I met when I lived in Manchester for 8 years before moving down here. She has been through probably the hardest of times with me and will remain a true friend forever. Emma is a great support, I can always count on her and so much fun too. When we met I was like.. ‘where have you been all my life!’ So this was an easy decision. I found their dresses from Kelsey Rose as I fell in love with the colour, and knew it would suit them both as Rochelle was dark and Emma was blonde and the top style worked really well with my dress too. When I suggested them they loved them and so they were ordered. Another big tick. The flower girls were both my beautiful nieces who I adore to bits and they wore a lovely coral dress from Monsoon. Our page boy Benjamin had a linen grey waistcoat and chinos to match with a slick white shirt without a collar – he looked gorgeous. Since my dad passed away it was not hard for me to choose who I wanted to walk me down the aisle. My brothers have been my best friends my whole life (well most of it even when I was an annoying little sister) and they were to walk me down the aisle. Who else would have this – I am extremely lucky to have two amazing brothers I’m really close to. The morning of our big day arrived so quickly. My family chose to stay in a lovely cottage attached to the Fossebridge Inn which had a beautiful surrounding with a lake in the garden. It was perfect for my family and was ideal for the Children. Will’s family stayed in Cirencester at the Fleece Inn, the rooms were divine and only about 20 minutes away. I guess there’s a bit more organising when you are not getting married in your local area, so we booked these really early. This was one of the first things I sorted out. It was a little drizzly but the sun kept creeping out every now and then. We had planned an outside ceremony but to be honest as Cripps Barn was so beautiful inside and out I really didn’t mind what happened – I would just find out when I got there. My mum had been praying for a rainbow (but without the rain!!) for months as a sign from my Dad so my mum was thinking now with a bit of rain there could be a chance. The morning was so lovely having all my family in one place and I loved having the kids around. This is where Anna and Simon came in. They literally just fitted into the day seamlessly. Anna even stopped me from getting a little emotional after I’d just had my makeup done and whilst everything else was going on they were going around getting the perfect footage and photo’s for us to remember every aspect of our day. Martin the hairdresser and Alice the Make Up artist arrived and also fitted in with the day. It was simply perfect and I was actually really calm at this point. Although I wasn’t actually due at the venue until 2.15pm, I wanted everyone ready about an hour before so we could enjoy our last time together as a family and the bridesmaids before I became Mrs Jordan. You have probably established I am a real planner by now. I think we actually managed it by 1.30pm. In this time I was able to give any gifts out to the bridesmaids and page boys. I got the girls a ‘Little Bean’ silver pendant from Molly Brown. My nickname is Little Bean so it seemed appropriate and very like the Tiffany bean which I love. I thought it was very apt for the day and I got Benjamin the pageboy a lovely pen to keep from the day with his name engraved in it. The kids also had some little bits to entertain them on the table when they arrived at the service. Zoe, my sister in-law presented me with a garter as a something borrowed and blue which was perfect. So everyone was ready to go and my mum looked stunning. Just to put my mind at ease I got a little text from Charlotte to say the room was stunning, and I had nothing to worry about, just as I’d planned it. Thank you Charlotte. Over at the Fleece, Will was getting ready with all his family and best man Tom. Our second shooter was Adam, yes Adam from Rock My Wedding!! Just in case you were wondering who else from Rock My Wedding could be involved! This was great as it meant we could capture what was happening over there too. I’m so glad he did as he got some really funny shots……sorry Adam to put you through this but it looked like a lot of fun 😉 Simon also got over there to get some great footage too. That’s another reason to get a videographer as there is so much the bride actually misses on the day. I got to see it all. ‘Bunny loves Jack’ also made an appearance. I had organised for Will to open a series of presents throughout the morning and this wowed him massively, just a little reminder of who he was about to spend the rest of his life with! Looking at his face I think he liked it, thanks to Charlotte and Anna’s amazing talent. Adam took some great natural shots of the Ushers lunch too, with Will and what seemed to be an entourage, having nine ushers. Will has some amazing friends and we really wanted to have all of them to be apart of our big day. Tom his best man came all the way from Australia, which meant the Stag do was only a week before the wedding, eeek! But all was ok. Thanks for lucking after him boys if you are reading. You may see a familiar face, Mr O’Shea… yes this really is a Rock My Wedding Wedding!! Will and James have been friends for years. Are you enjoying it so far? Just to add to the um…complete Rock My Wedding-ness of this whole she-bang as you are reading this we will be at Lisa’s house as we are using grounds near by for our latest self styled shoot location! Do leave a comment and let us know if there are any ideas you would like to steal.